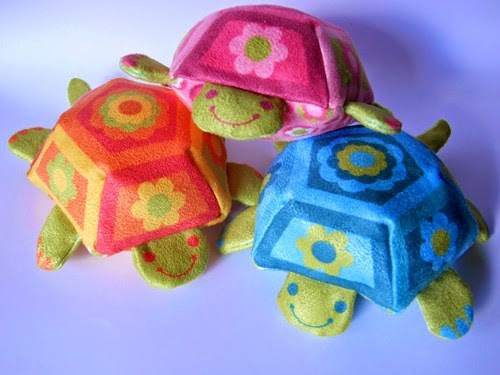 These tiny turtles with floral tummies fit on an eight by eight inch swatch of faux suede. The cut and sew designs are available in my Spoonflower shop and these are the instructions to stitch the little fellows up. First you will need your Tiny Turtle swatch. You will also need scissors, a needle and thread and some polyester fibre fill. Once all the pieces have been cut out you can stitch the sides of the turtle shell. I started with small stitches near the centre panel then towards the outer edge. Backstitch is a good stitch because it is nice and strong. The legs head and tail can be stitched leaving an opening to turn through where they attach to the body. TIP - a crochet hook is excellent to smooth out the seams and corners on the inside of the turtle legs, head and tail once they turned through. It is easier to stitch one side of the tail, turn it through and then stitch the other side. The feet can be a bit tricky to turn through but it does help to use a crochet hook to gently push them through. The next step is to place the shell and floral tummy right sides together. I put a small amount of fibrefill inside the head and then put it in position between the two layers. Carefully stitch along the outside placing the feet and tail between as you go around the shell stitching them in. Leave the section between the tail and back foot open to turn through. Once the turtle is turned through you can smooth inside the seams with a crochet hook, then fill with polyester fibre fill and stitch shut with slip stitch.